Our family costume idea was inspired by or favorite movie ever. Alison: Violet Beauregard: I made her costume by using flour and water dipped with newspaper to make paper mâché over a yoga ball. I measured my daughters head and made sure I left a circle opening on the top and bottom of the yoga ball. I let each layer dry for at least a day or two. I did 6 layers. Then I deflated the yoga ball and pulled it out. I then made sure my daughter could fit the ball over her head and cut the holes appropriately. I then cut holes for each hand to fit through. I use a hot glue gun to apply batting ($5) around the ball and then cut fabric (bought 4 blue laundry hamper bags from the dollar store and cut it) and used my hot glue gun to glue it around the ball. Then I glued 5 buttons ($4 from craft store) to the front. I used the red belt from the outfit Of verucas costume and hot glued it around the ball. Rita: wonka chocolate bar: I found the dress at a thrift store $9. I looked at the letters of a picture of a wonka bar online and traced it onto felt ($2). I cut out the letters and hot glued them onto the dress. Sofia: Veruca: I found a red dress at a thrift store ($6). The dress was too long so I cut it and hemmed it. I sewed the buttons ($5) on the front and used a black ribbon around the waist. I bought lace ($4) and hot glued it around the collar. Samantha: Oompa Loompa: I cut felt and pinned it cross cross over her shirt into her pants. I cut little squares and glued them to the collar of her shirt. I colored stripes on her white socks with a red sharpie marker. I used green hairspray on her hair and curled the top with my fingers. I painted her face with face paint light brown/orange and white over top of her eyebrows. Evan: Charlie Bucket: red fleece from a thrift store ($4). Satchel from thrift store $3. Ben: Mike Teevee: blue shirt from thrift store ($2). Red bandana ($4). Already had the hat. I made the golden tickets out of gold placemats from the dollar store ($2) and used a sharpie marker to write the wording. 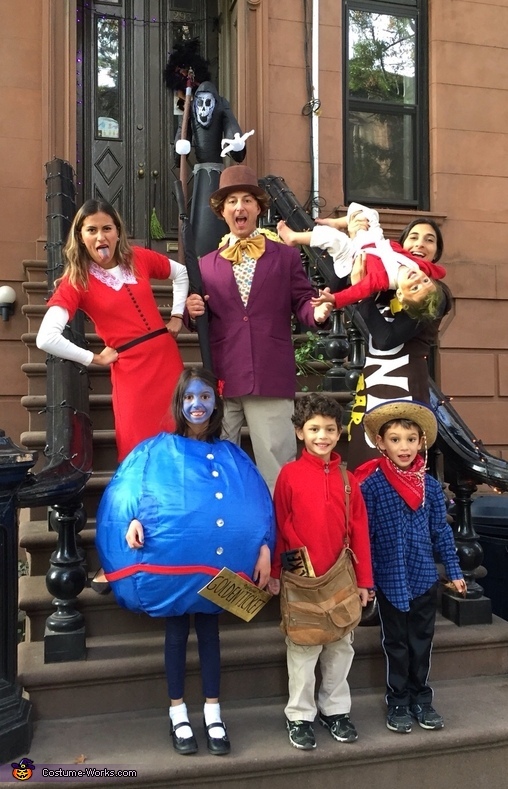 Overall cost of all 7 costumes was $81!